OK. Maybe I’m rushing it just a bit since it’s not quite Thanksgiving, but you really should start thinking about what music you plan to play for your family and friends this holiday season. I’ve got an excellent recommendation! Me! 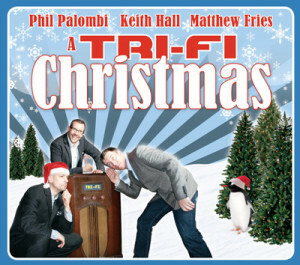 I released A TRI-FI Christmas last year with my trio, TRI-FI – just in time for the holidays. This album is a collection of holiday classics done up in a creative, modern jazz trio way. You can listen right here on my site. Available on the TRI-Fi website as CD, digital download or even HD audio! Note: The digital downloads on TRI-FI.com are CD quality – so much better than what you’ll find on iTunes.